This rhetorical reader emphasizes process by presenting a student essay in each chapter in both its first and final draft. 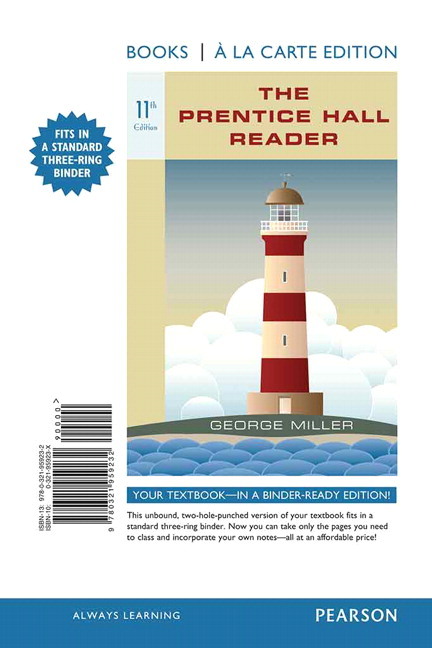 Widely adopted for George Miller’s supportive voice and highly reliable writing assignments, The Prentice Hall Reader balances classic and contemporary essays, arranged in increasing level of difficulty in each chapter. 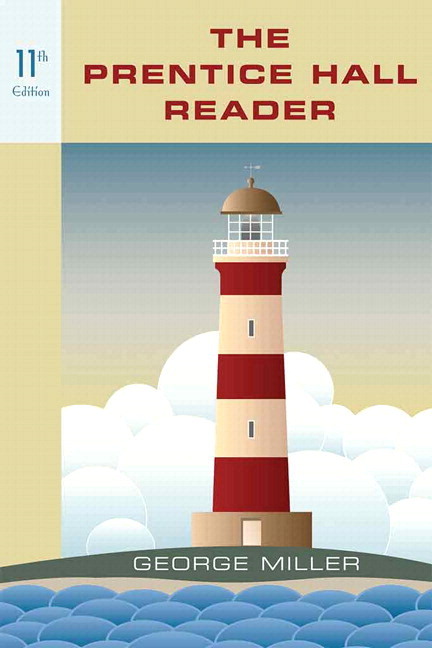 Extensive reading, writing, and research instruction and an exceptionally comprehensive instructor manual make this rhetorical reader an effective text for any writing program. Emphasis on revision--Each modal chapter presents a student essay in its first draft and final draft to emphasize the importance of revision in the writing process. Selections arranged by difficulty.--The readings are scaled in terms of length and sophistication–moving from a student example in the chapter’s introduction to examples written by professional writers arranged in increasing length, difficulty, and sophistication. Extensive greatly expanded chapter on writing the research paper, tracing it from idea to finished draft. Detailed advice on how to locate and evaluate print and online sources, with two new student research papers. Literary examples of each organizational strategy. A poem or short story is included in each of the nine chapters. These creative examples show how the strategies can be used to structure not just essays, but poetry and fiction as well. Each selection has discussion questions and writing suggestions. Detailed and extensive writing suggestions. Each reading is followed by four writing suggestions: the first is for a journal or blog entry; the second calls for a paragraph-length response; the third, an essay; and the fourth, an essay involving research. Extensive new lists of writing suggestions can be found at the end of each chapter. In all, the Reader has nearly 500 writing suggestions. Chapter introductions are organized around key questions that writers have. Emphasis on critical reading skills. In addition to a section “How To Read an Essay” at the beginning of the text, each chapter has an example of how critical reading skills can be applied to reading each rhetorical strategy. In addition, each essay is preceded by two questions that invite students to connect the reading to their own experience and to focus their attention on a close reading of the essay. Each reading has a “Critical Reading Activity” (in the Annotated Instructor’s Edition) as well as a “Collaborative” reading activity. Writing about images. Each chapter includes a section with writing suggestions. Extensive Web activities appear throughout the text and extensive advice on Web searching and evaluating Web resources. A Glossary and Ready Reference explains and illustrates common problems with grammar and writing, tying these explanations back to activities in the text. The links help build bridges between the content of the essays and the writing skills they reveal. The eleventh edition of The Prentice Hall Reader features fifty-five essays, twenty-three of which are new, eleven papers written by students, and nine poems or short, short stories that show the organizational strategies at work. As in the previous editions, the readings are chosen on the basis of several criteria: how well they demonstrate a particular pattern of organization, appeal to an audience of first-year students, and promote interesting and appropriate discussion and writing activities. • New readings. More than 40 percent of the readings are new in this edition. Readings come from a variety of emerging genres including blogs, self-help books, and web pages and include many new voices such as [[TK]], Michael Pollan, Richard Bolles, and Jhumpa Lahiri. • Expanded treatment of how to read an essay, with sections on how to write a summary and a critical analysis. A new essay dealing with the “soft skills” that employers are looking for in new hires is annotated, summarized, and analyzed. • New apparatus for each essay. The “writing suggestions” and the section “for further study” for each essay have been re-cast and re-written. 1. “Finding Reading Connections” links each essay to another in the Reader and provides an essay topic through which that link can be explored. 2. “Linking to an On-line Reading” extends the conversation by suggesting a specific on-line reading that students can pair with each essay and then offering a writing suggestion that links the two. 3. “Writing the Research Paper” suggests topics that can be explored through the Web and print sources for writing an academic essay with formal documentation. • Revised chapter on the research paper now moves from providing simple documentation in a traditional essay to preparing and documenting an academic research paper. Special attention is given to using and documenting on-line sources. • New student examples in Chapters 7 and 9, with first drafts, revision suggestions, and final drafts. • Learning Objectives have been added to each chapter, clearly establishing chapter goals at the start. • Timely readings appealing to college students. The new essays add topics such as job skills, discrimination based on physical appearance, campus suicide, campus engagement by gender, MOOCs, how to avoid being “hacked,” children’s exposure to junk food, and vegan versus balanced diets. "Everything had a name, and each name gave birth to a new though. As we returned to the house every object which I touched seemed to quiver with life." [[*]]In literature: Ron Wallca, "Worry"
"'Yes,' I whispered to teh stranger on the phone... On that date, I have birth to a son." “I soon learned what shuold have been obvious- Nana was suffering from dementia." [[*]]In prose: Rebecca Donatelle, "Immediate Effects of Alcohol"
[[*]]James Paul Gee, "Games, Not Schools, Are Teaching Kids to Think"
[[*]]Mark Bittman, "eating Food That's Better for You, Organic or Not"
“People don't...realize 'organic' doesn't meant 'local.' It doesn't matter if it's from the farm dowm the road or from Chile... As long asit meets the standards it's organic." “There may be no escaping the 'princess phase,' but teaching kids to view media critically can help make sure your princess doesn't grow up expecting a handsome prince- or a fairy godmother- to solver all her problems." [[*]]In prose: James Paul Gee, "Games, Not Schools, Are Teaching Kids to Think"
Debate Casebook: Are Performance Enhancing Drugs Cheating? Perspectives for Argument: Is Using Performance Enhancing Drugs “Fair”? Debate Casebook: What Are the Ethical Issues Surrounding Human Organ Harvesting and Donation? Perspectives for Argument: What Moral Issues Does Transplantation Raise? [[*]]Debate Casebook: Is a Vegan Diet Healthier Than a Balanced Diet? Debate Casebook: Are You Willing to Save a Child’s Life?